What Is An 18-Inch Dishwasher? For those of us that live in smaller homes, dwell in tiny urban apartments, or just don’t have the kitchen space we’d like to, having a standard 24-inch dishwasher can really take up some unnecessary space. A full-sized dishwasher in a not-so-full-sized kitchen can prove to be bulky, cumbersome, and a waste of valuable real estate – particularly in a room that sees as much action as the kitchen typically does! However, there’s hope yet for those of us out there who are committed to living in small spaces, yet still want the convenience of a dishwasher (because, let’s face it, living life without one just isn’t an option!). Ladies and gents, welcome to the world of 18-inch dishwashers. Designed with smaller homes and kitchens in mind, an 18-inch dishwasher is a slimmer version of the traditional dishwasher you find in homes across the world. This nifty little appliance is ideal for anyone that lives in a tiny home or apartment, or simply just doesn’t have the need to do huge loads of dishes every week. However, don’t let its slimmer size fool you into thinking it’s somehow less functional. Many of the same features and functionality you find in a regular dishwasher are all available in the slimmer 18 inch units. They’re just compacted into a more convenient size and shape. Bottom Line: If you just don’t have a lot of kitchen space, or you usually find yourself scrambling to fill a larger dishwasher just to start a load, then perhaps an 18-inch dishwasher model is the best fit for you. Below, we have listed out the best 18-inch dishwashers available, ranked by your reviews and feedback, as well as a few tips to help you find the best unit for your kitchen. Get ready to enjoy those minimalist kitchen vibes. Depth w/ Door Open: 45"
This isn’t exactly a one-size-fits-all scenario – the beauty of opening your world to the 18-inch dishwasher is that you’re able to pick and choose between several different types, depending on your personal aesthetic and living space! There are a ton of style options out there for those who’d prefer a smaller dishwasher – everything from slim built-in models, portable units and those that sit comfortably on your countertop. 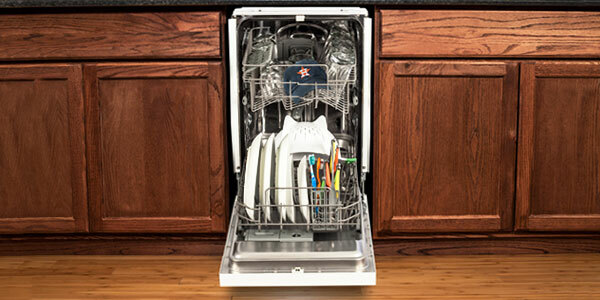 When it comes to this size dishwasher, you’ll generally have two types to choose from — built-in and portable. This is the standard model of most dishwashers, no matter how small or large they may be. A built-in dishwasher typically fits cozily under a kitchen counter, though, of course, the slimmer 18-inch variation provides the snuggest fit possible. In addition to being the norm among 18-inch models, in terms of noise, the built-in model is also thought to be the quietest option available. 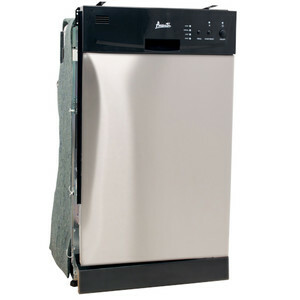 Portable dishwashers are skinnier versions of a traditional 24-inch unit… just on wheels! This type of dishwasher isn’t connected to the permanent plumbing fixtures in your kitchen, making it super easy to integrate into your space, store away or take with you on-the-go. An 18-inch dishwasher with portable functionality is also particularly handy if you live in an apartment – not only are you able to store this type of dishwasher in a closet or other convenient area when you’re done (rather than sacrificing valuable counter space! ), but you can take it with you when you move to a new home, as well. Like most appliances in your home, not all dishwashers are created equal. When it comes to buying an 18-inch dishwasher, they all typically come equipped with the same general set of features, it’s important to know what these are. Not only will you be more informed about your potential purchase, but you’ll be better-equipped to determine what sorts of “extra” features you might like to take into account. 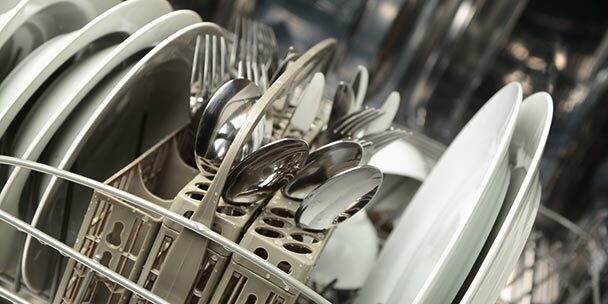 Dishwasher capacity is measured according to how many dishes, pans, and utensils (or, place settings) are typically loaded in one wash – many 18-inch models can hold up to 8 standard place settings. 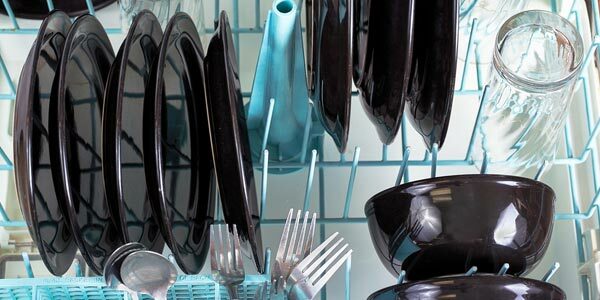 Before purchasing a new dishwasher, try to estimate how many place settings you usually put in a single wash. This will help give you a better idea of the exact desired capacity in your ideal model. Some dishwasher models have adjustable racks, allowing you to move them around according to the size of the specific load you’re washing. So, if you routinely wash larger pots, or just want more flexibility when you do a wash, the style of rack within the unit is an important feature to consider. The selection of wash cycles your potential dishwasher has may make or break your decision to buy it. 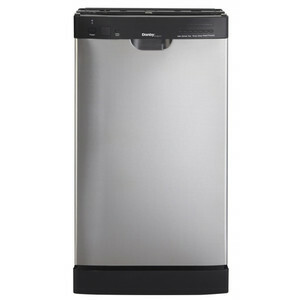 Most dish washing units usually have three cycles (for light, normal, or heavy loads) – but, for example, if you’d like a model that’s capable of cleaning your high-quality (and very fragile) wedding china or getting all the gunk off of that pot that has been sitting in the sink for days, you may want to consider buying a dishwasher with more cycle options. The more advanced your jets, the cleaner your dishes will be! If you’d really like to ensure that those pesky particles from last night’s pasta dinner come off your plates, you may want to look into buying an 18 inch dishwasher that employs steam or high-powered “turbo” jets. There are a few different options out there for drying your dishes. For instance, some new dish washing models employ a heating system during the dry cycle – cutting the normal time it takes to dry dishes virtually in half. When searching for the best unit for your home, be sure to take a close look at how the drying process works, and whether you have different options to chose from. 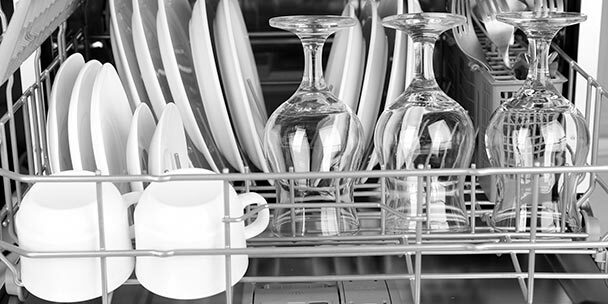 While the above list of features will be pretty standard, here’s a few more that you should consider in your hunt for the best 18-inch dishwasher. They may not be an ideal fit for you, but they’re definitely features that you should look into. If being environmentally conscious is important to you, you may want to consider a dishwasher that’s been given an EnergyStar rating. The Environmental Protection Agency (EPA) uses this rating system for letting consumers know which dishwasher models are the most energy-efficient. This will not only cut the amount of energy and water you use, but ultimately save you money in the long run. 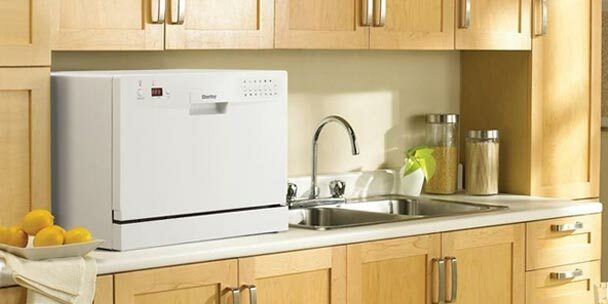 No matter what model you get, here is a list of tips that will help your dishwasher be more efficient. 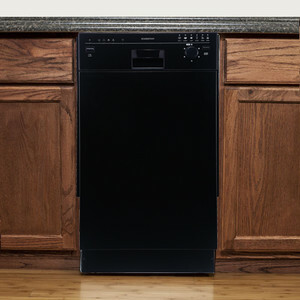 Many of the newest 18-inch dishwasher models have intuitive capabilities, such as sleek touch-pad control panels, wi-fi connectivity or an app to help you control it with your smartphone or tablet. Some “smart” models even have sensors that can actually determine how dirty your dishes are, and then adjust accordingly to slash how much water it uses. Pretty neat! Let’s face it, some noise is inevitable when it comes to dishwashers – after all, these machines are hard at work! But, some dishwasher models are definitely insulated better than others, rendering them less noisy or even near-silent. 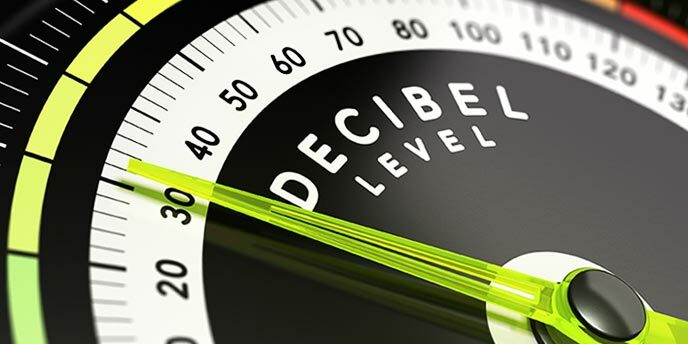 If noise is a concern for you, be sure to look for the decibel rating of each unit. This will give you a better idea of how loud it will be. If you typically do dishes in the evening when family members are sleeping, the decibel rating might be an important feature to consider. Inarguably the most gleaming, modern-looking dishwasher model, the stainless steel washer is the perfect appliance for the budding Top Chef’s kitchen. But, not only does steel look modern, it’s actually a more durable option, as well – you can definitely bet on a stainless steel model to last longer than its counterparts. Whether you live in a tiny home with paltry kitchen space, or you just find yourself doing half-full loads of dishes every other night, an 18-inch dishwasher is certainly worth looking into. There are many options, features and finishes to consider, but the right model is out there waiting for you! You just have to find it. 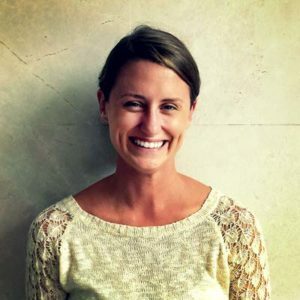 Justine is a writer and storyteller based in Austin, Texas. Other than writing, her foremost passions include travel, languages, books, dogs, the Criterion Collection, cooking, and minimalist living. In her spare time, she''s currently working hard to overcome her fear of urban biking. Find out more about her freelance services at JustineHarrington.com, or connect with her on Twitter at @_JustineLee. 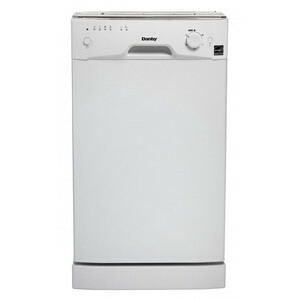 When you say 18 inch dishwasher, are you referring to height or width? My problem is how tall the dishwasher measures. 18 inches would be a perfect height. The width is less important. Standard counter tops are ~ 33″ high. 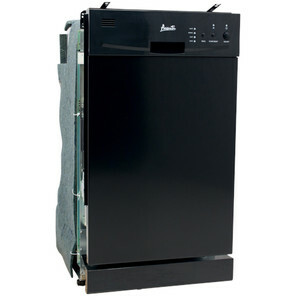 If you have limited vertical space you might consider a “counter-top” model dishwasher. They are around 18 inches tall. My dishwasher that is currently installed is 18.8 inches across, all the ones I see ate 18, what can I Do?